I usually try to share the Military Working Dog photo of the week produced by writer Kevin Hanrahan. 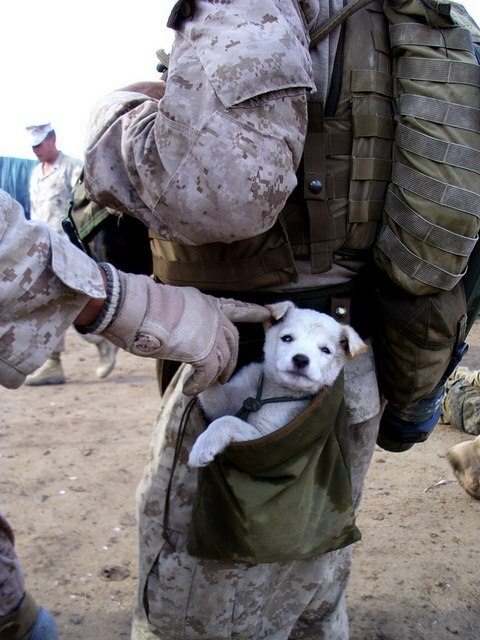 Well instead of a military working dog – here’s a photo of the military working for the dog, or puppy in this case. I believe I have seen this photo on Kevin Hanrahan’s blog, but it is now making the rounds being share of active duty units. I just saw it posted by CENTCOM. I can not express how much I respect these soldiers, to have the bravery to protect & fight for freedom, to be so well trained they can operate as a well oiled machine. Yet to have a heart that is soft enough to have compassion for a cute little puppy with tired legs who has been following them. RESPECT!